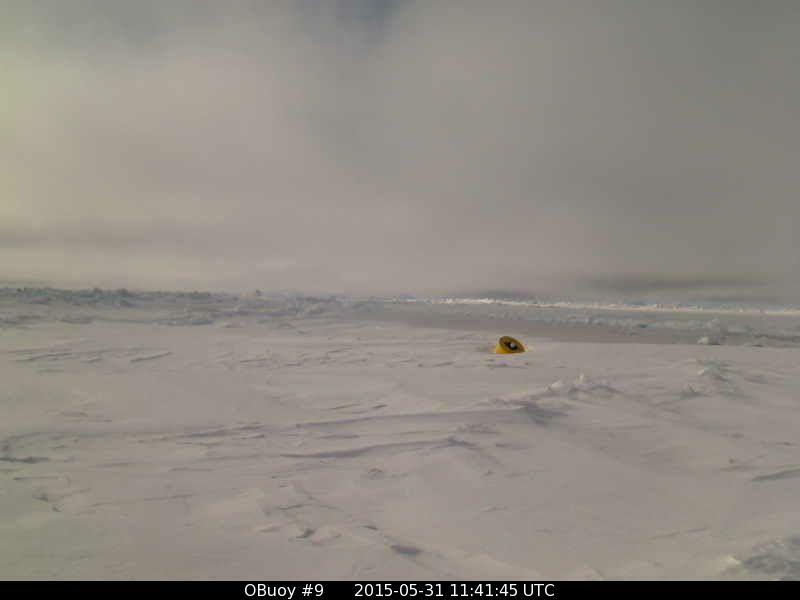 Faboo (short for “Faithful Buoy”) continued the slow drift the wrong way, back towards its starting point at the North Pole, though it is difficult to make headway with so much other ice in the way. The official report had us at 87.099°N, 2.566°W at 2100z last night. 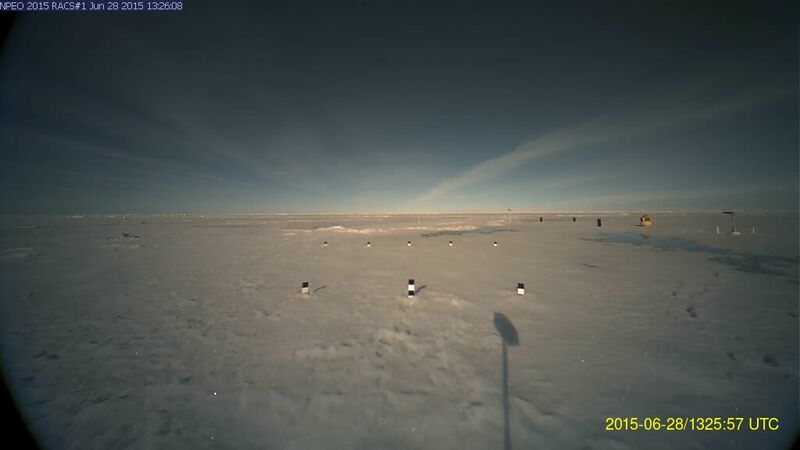 The eastward drift stopped at 0300z, at 2.334°W. and now we are inching west again. We’d moved 2.76 miles back to the north in the 24 hour period. When you consider that back at noon on June 14 Faboo was at 87.105°N, 4.652°W, it becomes obvious the ice isn’t making much progress. In 2 weeks we’ve traveled 7.28 miles, mostly to the east. The Quietude continues. The speeds in the above map are measured in centimeters per second, and the blue areas are less than 0.2 mph. The ice isn’t going anywhere, except just north of Greenland and over along the East Siberian coast. 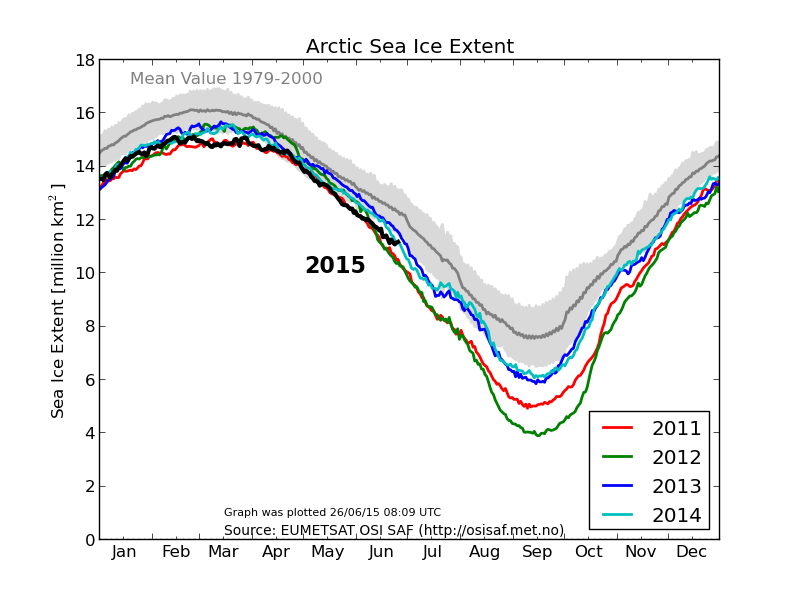 This is one reason the ice-extent graph has stopped declining. 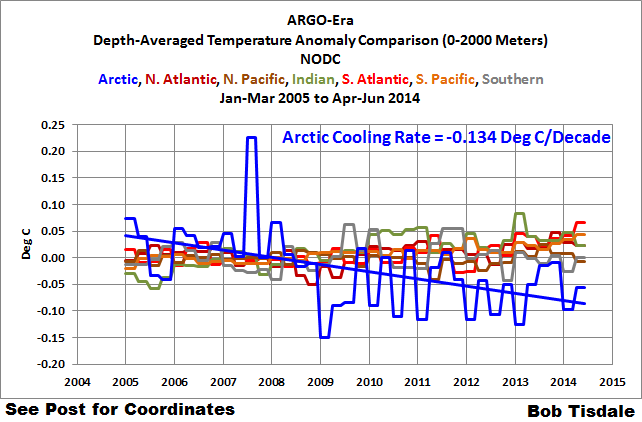 If the current flat-lining graph continues much longer you can expect a hubbub about it, as Skeptics can never resist taunting Alarmists, when the Death Spiral doesn’t manifest. However I bite my tongue, as often flat-lining is followed by a sharp dip. Another reason may be the lack of sunshine at the Pole. Bright sunshine is a great slush-creator, even when temperatures are below freezing, but gray days don’t make much slush, (unless there’s fog), even when temperatures are a bit above freezing, as they have been. Faboo edged above freezing at 0600z yesterday and peaked at +0.3°C at 2100z. However picture after picture shows a gray scene, and the closest I could get to any blue sky was from 1933z yesterday. I don’t see what the use of 24 hour daylight is when the sun never shines. I’m hoping those footprints were made by the scientists setting up the site, and have simply been exposed by the thaw. If they are signs of a snooping bear there could be trouble, as the bears tend to scientifically investigate the cameras, to see if they are edible. 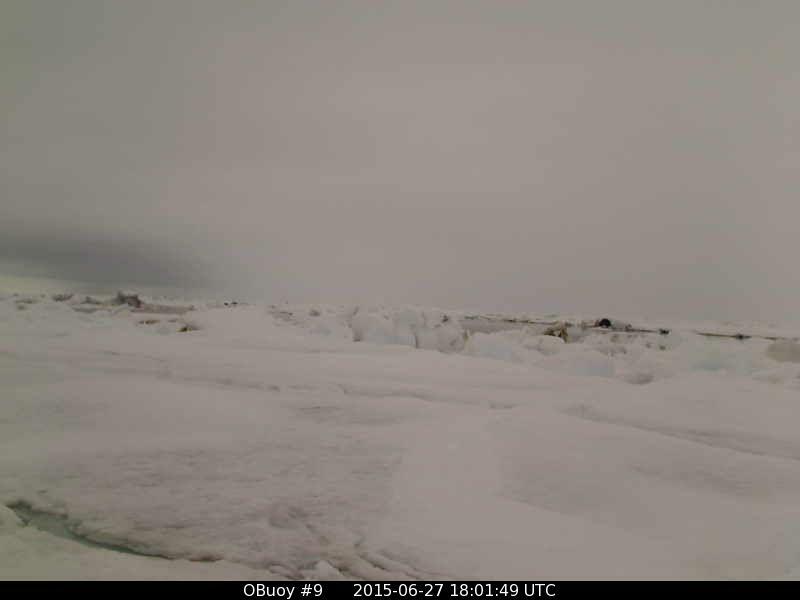 The gray weather is also occurring at our other cameras. 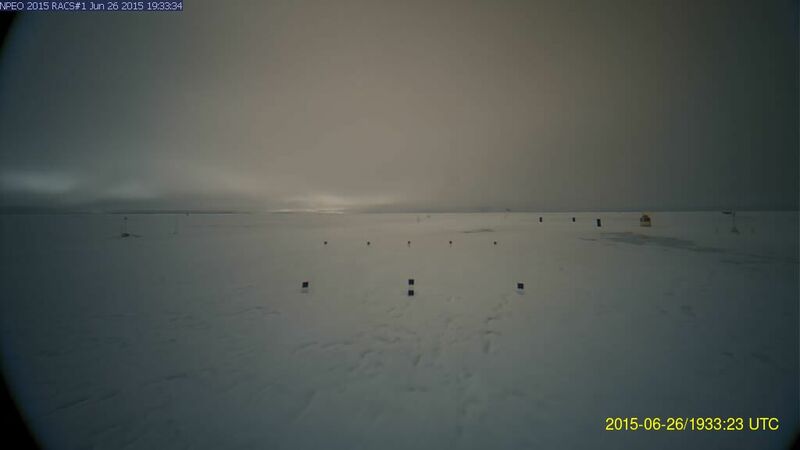 (Four of the cameras we started the season with are now not functioning) O-buoy 9 is showing the lead in front of it crunching shut O-buoy 11 is showing a lead starting to open up, to middle right. 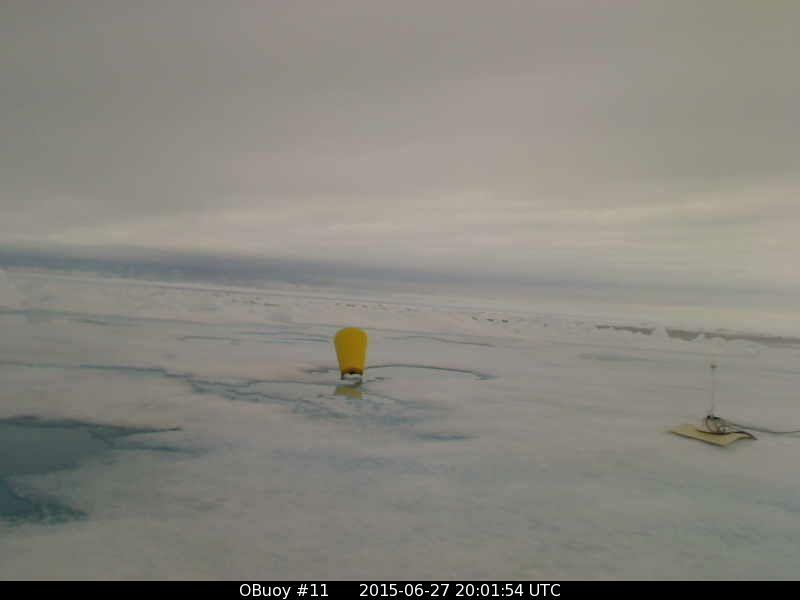 And O-buoy 12 shows the melt-water pool to the left finally getting back to the size it was two weeks ago. However the primary observation I make is how gray it is. 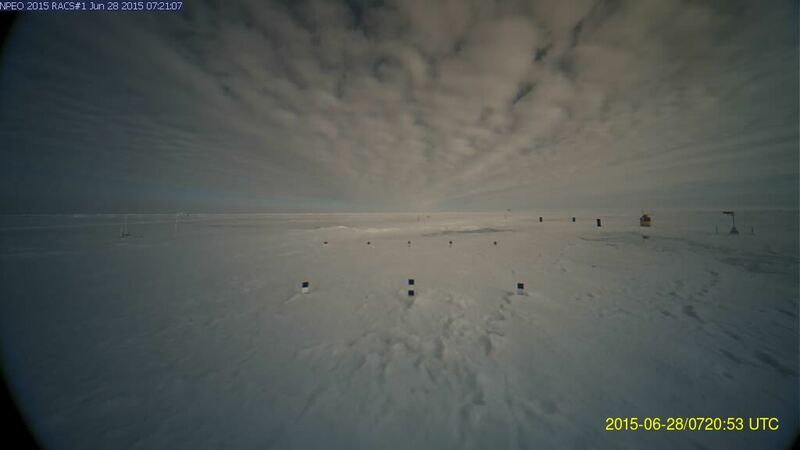 Of course, these only represent 4 microcosms in a vast arctic, but the past summers have simply seemed far grayer than I recall earlier summers being. If some scientist did the careful calculations and determined they actually were cloudier, I imagine that could explain differences in the surface melting. The maps show weak lows circling a high that his hogging the Pole. You might think high pressure would bring sunshine, but I haven’t seen much. “Balt” is drifting east across the Kara Sea, “Folfol” is retrograding to perhaps merge with Balt, in the Laptev Sea, And “Follower” has crossed and looked like it was going to sink into Alaska, but now some models show it doing a U-turn and trying to bump the High Pressure off the Pole, which I doubt will make it much sunnier. The models are having a hard time handling this sluggish pattern, because there is so little definition between the high pressure and low pressure they don’t have much to work with. The fun thing is that they produce interesting events (which never happen) around seven days into the future. The Mass Balance Buoys haven’t updated. I suppose the fellow in charge deserves a weekend, like everyone else, but it means I have no real news to report. However that never stops the mainstream media, so why it should stop me? 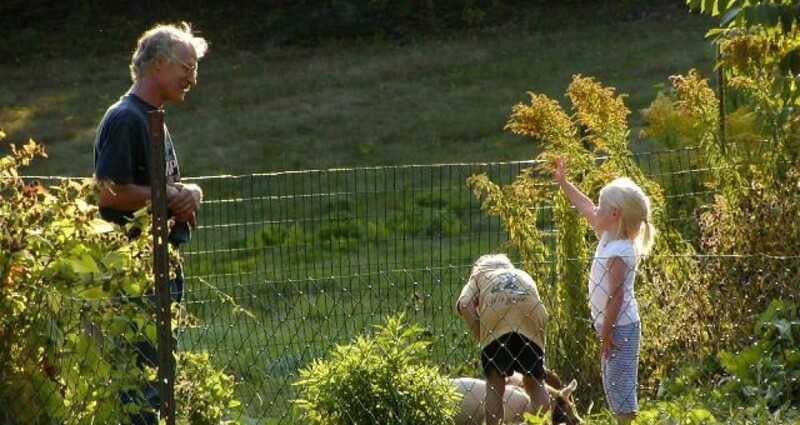 The trick is to search and observe something interesting, and to make that the news. 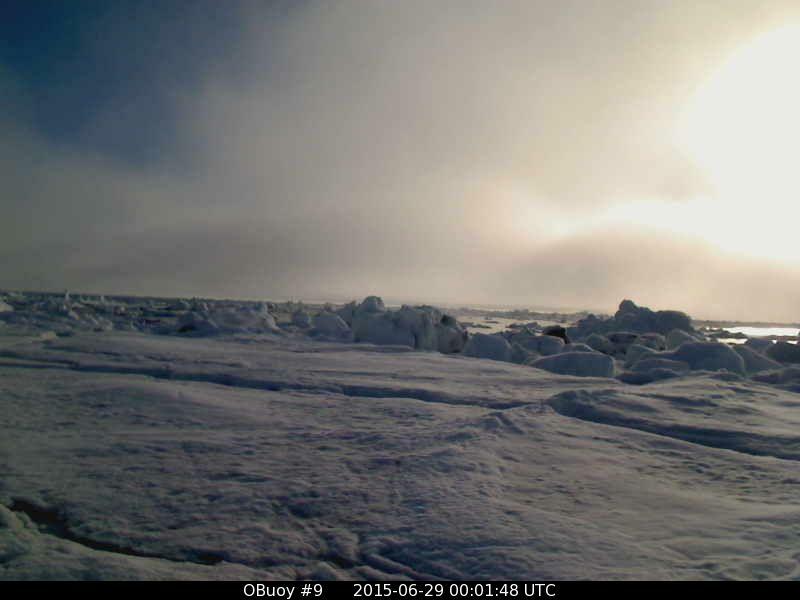 The arctic is always full of interesting stuff. One thing I have observed is the failure of the Laptev Notch to reappear, so far. There is only a skim of ice remaining on the Laptev Sea, but in terms of concentration, it doesn’t yet have any “ice-free” areas. 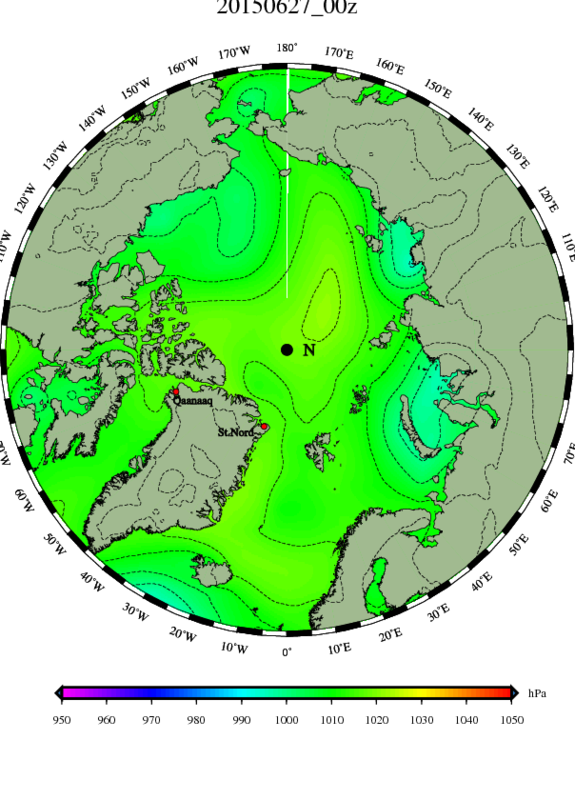 Last year at this time the Laptev Sea was already starting to show areas of open water, which expanded impressively through the summer until the open water extended like a shark’s tooth towards the pole, north of 82° latitude and giving Alarmists reasons to cheer. I myself called the shark’s tooth “the Laptev Notch” and figured it was due to the fact the Laptev Sea had exported impressive amounts of ice northward, the winter before. The ice moved across the North Pole to jumble up against the Canadian Archipelago and Greenland. The Laptev Sea commonly exports more ice than any other arctic sea, even though it sometimes exports triple the amount it exports other years. The winter of 2013-2014 seemed a good year for exports, and it meant that the sea kept having to form a new skin of ice, which was quite thin when the sun came up for the summer and began melting things. That open water was still there after the sun went down, and can be clearly seen jabbing north of 80° as late as October 22. One interesting thing to note in the above map is that it is freezing along the Laptev Sea’s shore first. This is in part because of enormous amounts of fresh water the Lena River’s floods poured out. The flow of that river fluctuates wildly; 40% of its yearly flow occurs in August. (Then it freezes up and 3% of its yearly flow occurs in January) The inshore waters, especially at the surface, are much fresher than off shore parts of the Arctic Sea, especially in the early autumn. Another reason for the early inshore-freeze was that Siberia had early and extensive snowcover last year, and already the land had switched from being far warmer than the Arctic Sea to far colder. This tends to shift the winds from sea-breezes to land-breezes, as the relatively milder ocean causes air to rise, and the colder, heavier air flows out to sea to replace it. Initially this freezes the inshore waters, but as the difference becomes larger bone-chilling gales can roar from Siberia out towards the Pole, and this pushes the ice itself out to sea, forming a polynya of open water by the coast even when the winds are at -40° or even lower (-70° has been seen). This is the dynamic that allows the Laptev Sea to export so much ice. Also, as you look at the animation, you can see some export of ice and polynya-formation in the Laptev Sea last winter, but the real activity was over in the Kara Sea, which may have even rivaled its neighbor, in terms of exports. This may be a reason the Kara Sea is more ice-free this summer than last summer, and part of the reason the Laptev Sea has more ice; (it simply exported less). However my mind is toying with other ideas as well. I’m wondering if having so much open water at the end of last summer might not have allowed the Laptev Sea to be churned more and cooled more, and it might just be colder now, and therefore less likely to melt ice from the underside. In any case I am going to watching the Laptev Sea very carefully the next 45 days, for if it does not thaw to the degree it thawed last year, it could make a big difference in the sea-ice extent graphs. 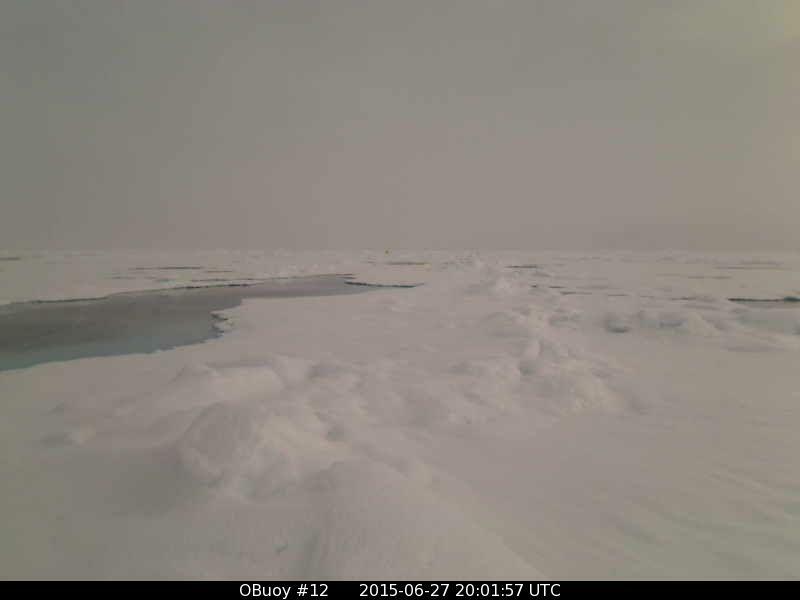 I checked out the O-buoy cameras, but they just show gray sky, and I can see that if I look out my window. It’s a gray Sunday in New Hampshire, with a sweeping summer rain and air coming down from the waters of Hudson Bay, which still have ice. Brr. Maybe I’ll write a “Local View” post, for there is no way I’m heading out to weed in the garden, that’s for sure. I’ll update in the evening, when Faboo’s official data comes in. I am going to have to cut this post short, for the animation above overwhelms the rather low IQ of my ancient computer, and forces me to wait longer than I like to add anything. Faboo reported in, and told us he made it as far north as 87.102°N, before succumbing to peer pressure and heading south again. His contrary nature had to find satisfaction in continuing west, finishing the 24-hour-period at 87.087°N, 3.318°W, which is 2.76 statute miles to the southwest of where we were. Temperatures bounded about, as peer pressures opposed. 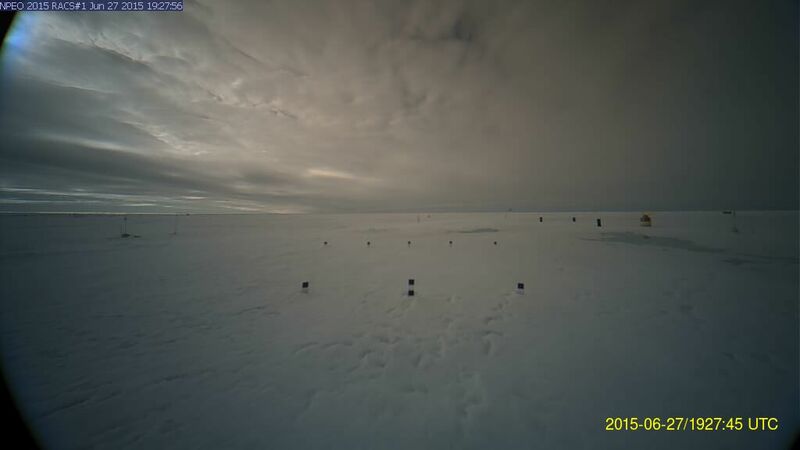 Temperatures crashed to -0.5°C at 0300z (Skeptics pouted serious approval), and rebounded to +0.4°C at 0900z (Alarmists now nodded with their approving and dignified frowns,) but then fell to -0.3°C at 1500z (Skeptics nodded more vigorously) but then rose to +0.1°C at 1800z (Alarmist nodded even more vigorously) at which point Faboo did the only safe thing, which was to arrive at exactly 0.0°C at 2100z. Unfortunately this precipitated a ferocious battle between Skeptics and Alarmists about whether 0.0°C constituted thawing or not, at which point Faboo wisely tiptoed from the room. Immediately the gloom was gone and blue skies appeared. This should be a reminder (to me, if no one else), that the real reason to study Truth is that Truth is Beauty. 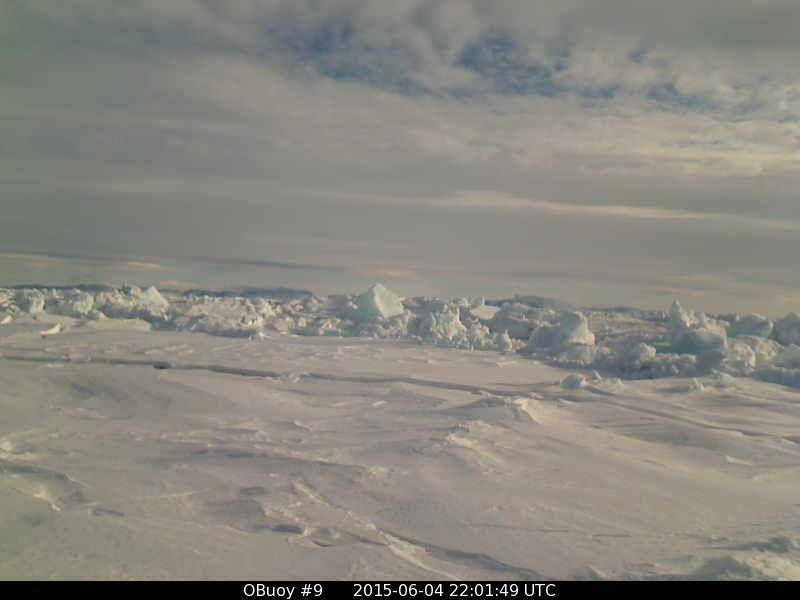 Speaking of which, I’ll conclude this post with a truly lovely picture that comes from O-buoy 9 this evening. Considering how close the crack in the ice is, the days this camera survives may be numbered, especially with a gale brewing over the weekend. Temperatures have risen towards freezing, and the breezes are strong, (up towards 20 mph) which has stopped the westward movement of the buoy and now is ramming it back east.